Hello lovelies! 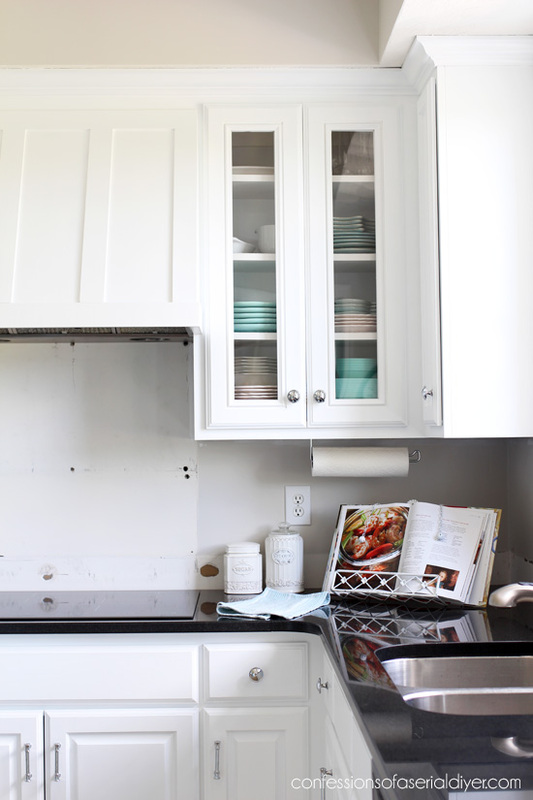 I am so thrilled to have ya’ll following along with my kitchen update with me! I was able to cross two more items off my to-do list this week. The first is replacing the old pendant lights. They were perfectly functional, but a little boring and on the small side. I am so excited to share the new lights I found! I found these on Amazon HERE and I just knew they were the ones! They were really reasonably priced too. 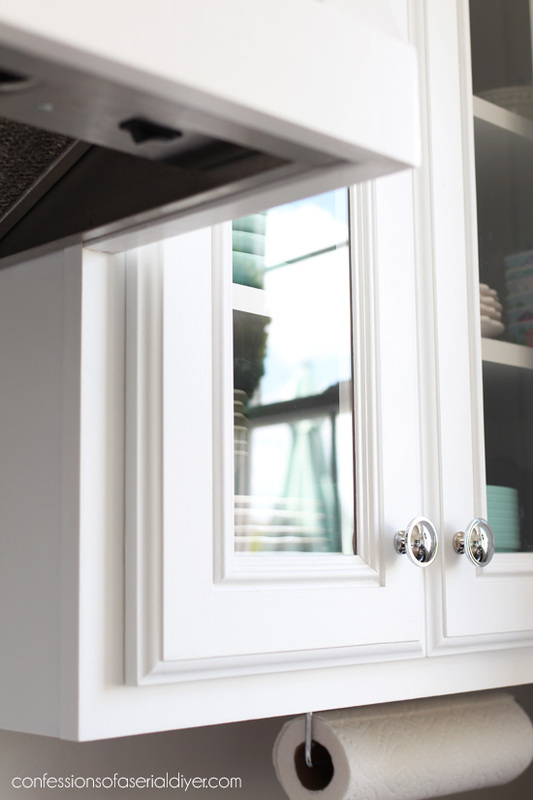 And they match the chrome hardware on the cabinet doors and drawers. Do you spy what else I was able to cross of the list? My cabinet finally got its glass doors! Well it’s plexiglass actually. Looks like the real deal but I was able to cut it myself! I love how they turned out. 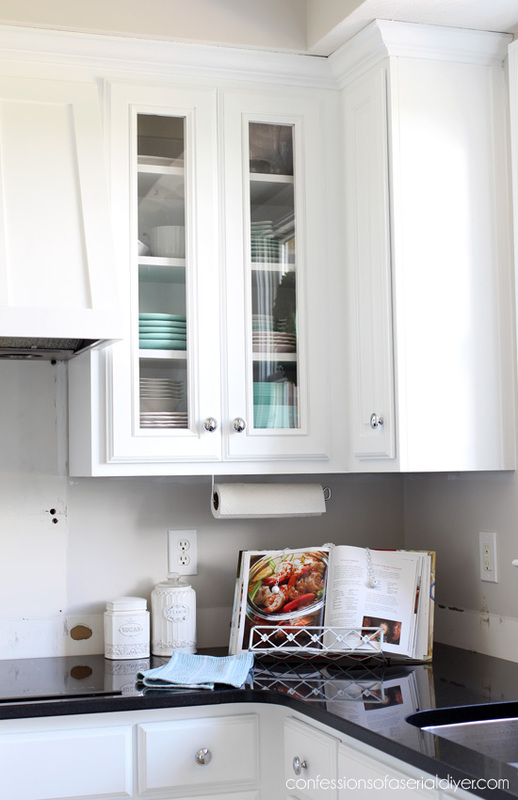 See how I swapped the raised panels in my cabinet doors for glass HERE. I used the very same method as I used in that tutorial from our last kitchen. They add a little more interest to that corner than the plain cabinet doors would have. So that’s two more projects closer to being done woohoo!! And then finally this room will be done! Speaking of the floor tile, the backsplash I chose works well with it, and I am kind of loving how it is looking with what we have going on in this space now so it looks like it might be staying for a while. There will always be the option to change it out down the road if I change my mind. I hope you are enjoying seeing this space come together as much as I am! Can we say hoarder?? That’s almost everything from my storage room minus the furniture! It is the only room downstairs that has carpet and that will be getting swapped out as well so I had to empty it out. 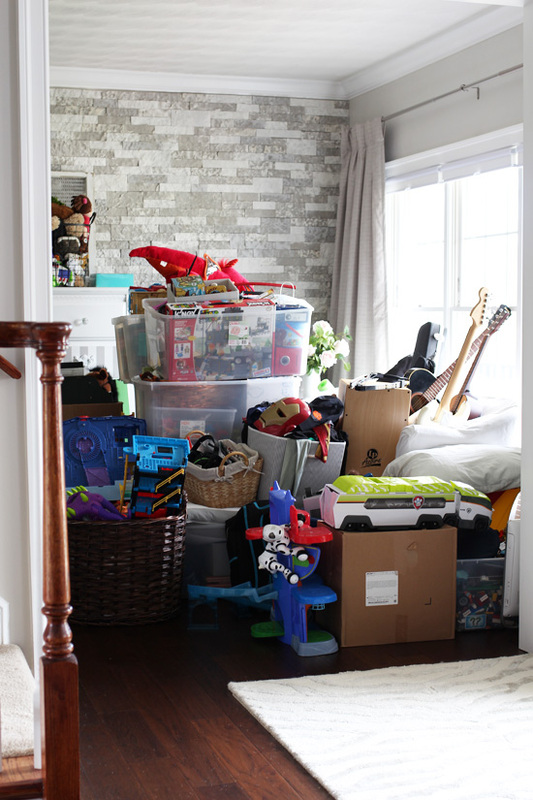 That’s the contents of the boys’ rooms. All we were allowed to leave up there was the furniture. 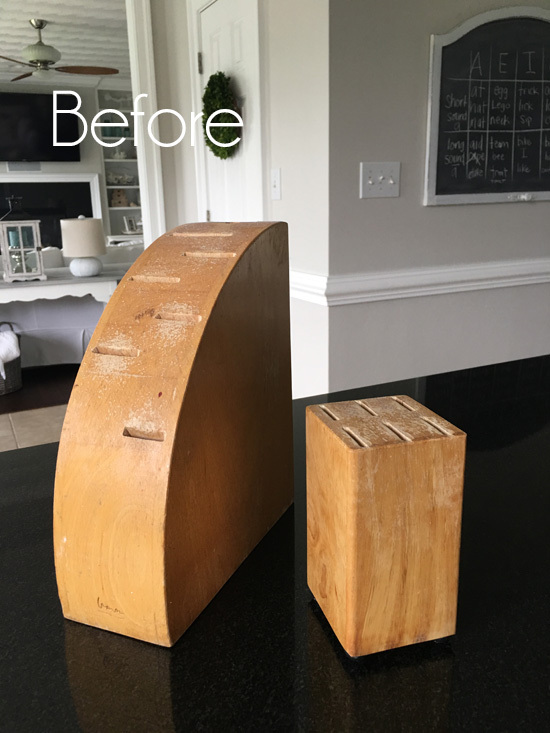 UPDATE: See how I gave these knife blocks a whole new look HERE now! Wow, what a transformation so far. You sure have been busy! I am enjoying seeing the room come together, probably more than you since I am not doing all the work! It is all turning out so BEAUTIFUL! Keep up the good job and looking forward to seeing the rest! 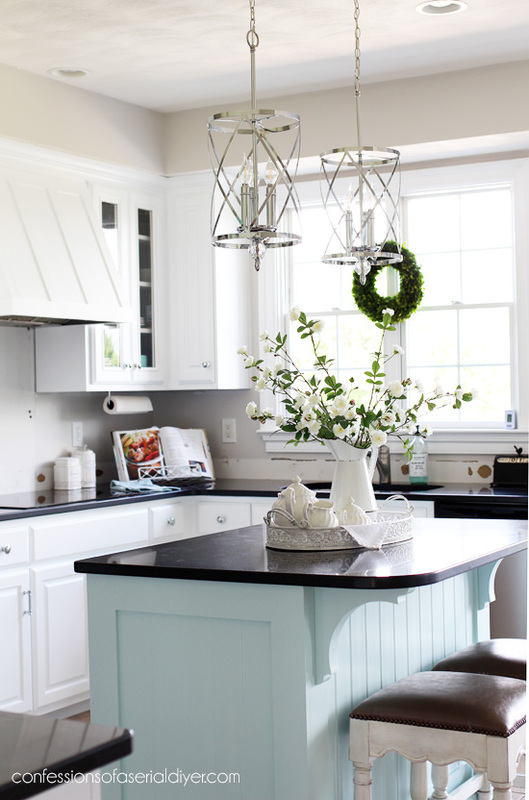 beautiful new lights – perfect addition to the new kitchen; glass cabinet door with those dishes once again tie in the colors from the island and living room. nice job. and hoarder you are not cause you upcycle! 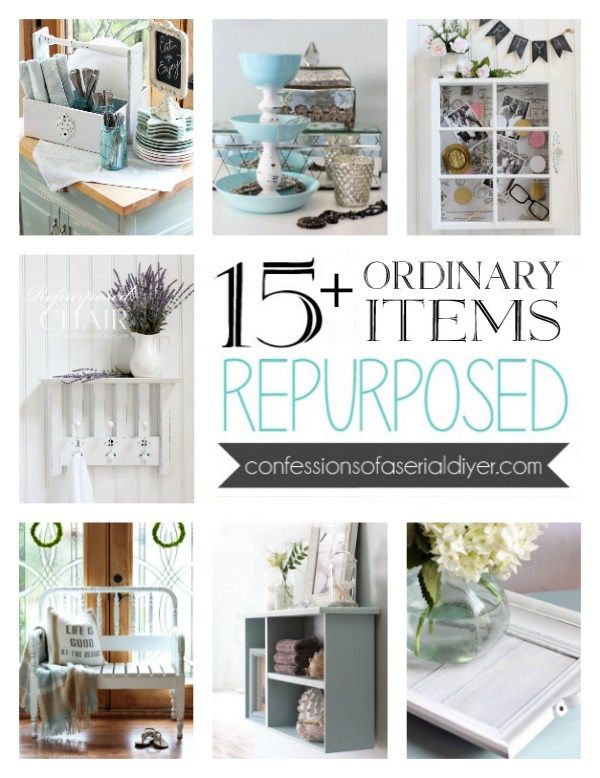 have seen real hoarding from other bloggers who work their stash but have more hoards than time. all in the fun of creativity. never mind what others might say as long as you enjoy your overhauls and projects. naysayers often don’t have the skill so they like to criticize. more power to you! you’ve done mahvelous work, dahlin’! Christy! Your kitchen is gorgeous. Your lights are stunning! Totally stunning. They are the absolutely perfect touch. I love the way they are the same bright chrome as the cabinet knobs. What a beautiful choice you have made. I also love your glass inserts. I have a couple of cabinets with glass and even though I have to keep them neat, it is so worth it. 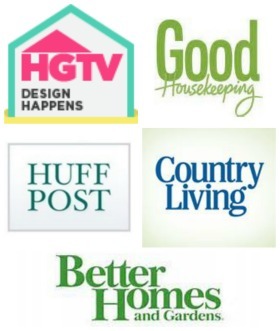 You and your hubby do amazing work. I can’t wait to see everything else. Busy busy busy Christy!! 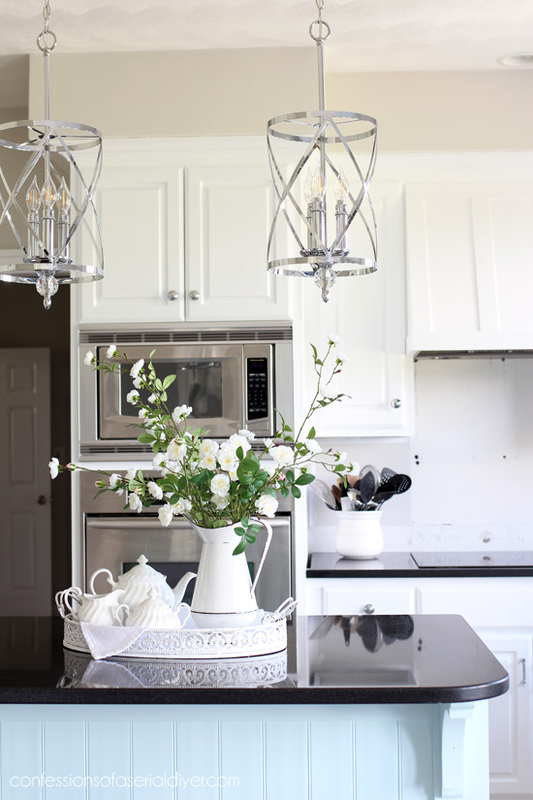 The pendant lights are so you! 🙂 The glass doors are perfect. Go you! Your kitchen is looking great! I love the pendant lamps you chose. They are like beautiful jewelry for your kitchen. Thankfully, the carpet chaos is temporary. When you put everything back, you’ll have the opportunity to assess whether you really want to keep things. The thought of clearing out the rooms has kept me from getting new floors, so I feel your pain! 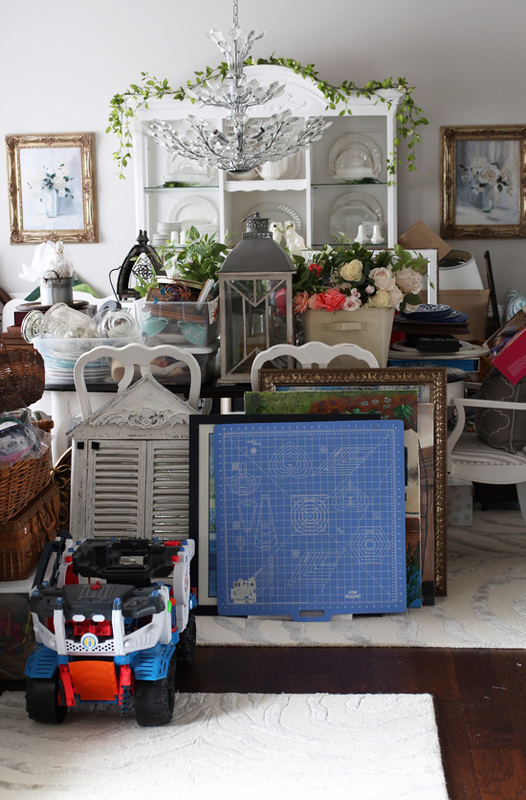 Best excuses for purging clutter: have company or redecorate! Your kitchen looks so nice. I love the lights you picked out. Oh, I love the pendant lighting! The kitchen is looking wonderful! Very nice, as always! And plexiglass?! Never would have thought it-great idea! Kitchen glamour!!! Now if THAT isn’t beautiful, I don’t know what is! My goodness, I’m going to have to go back to pestering my husband about helping me figure out island lighting again… If there were already something there to work with, it’s be a LOT easier, but we’re going to have to start from scratch. Not an easy-to-talk-husband-into project. : ) Maybe I’ll show him your pictures!!! Thank you, Becky! I am so in love with these lights I can’t even tell you! I just knew they were the ones as soon as I saw them. Yes, show him this picture… Maybe it will win him over ha ha! Love your pendant lights, you’re doing great, keep it up! It will all be worth it! I had a laugh at your front room photos, we recently moved so that sight is all too familiar to me! 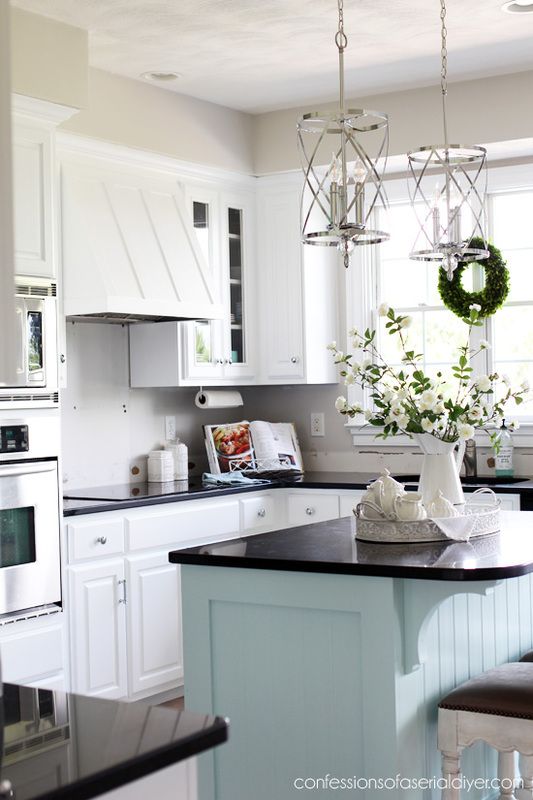 Your kitchen looks lovely, nice job on everything and the pendants are beautiful. I noticed immediately that you got the glass in the cabinet doors. 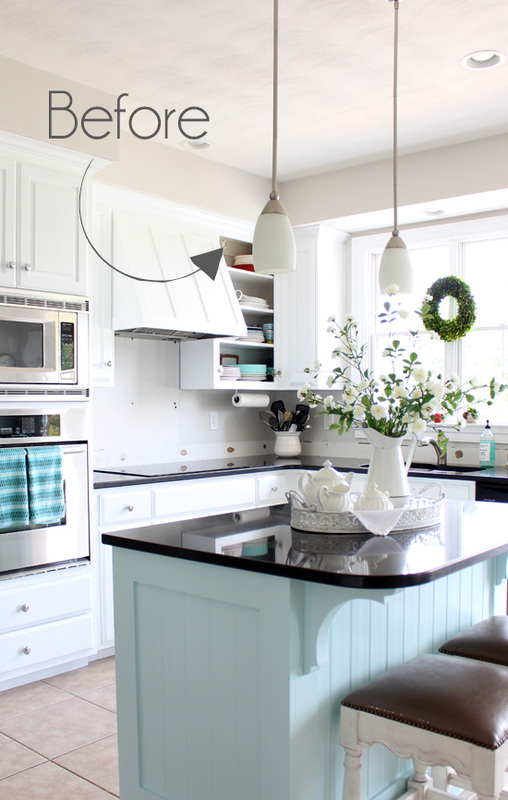 Oh, how I love those fancy schmancy pendants – they are so pretty and the perfect scale for your island. Your kitchen is looking good my friend!! P.S. 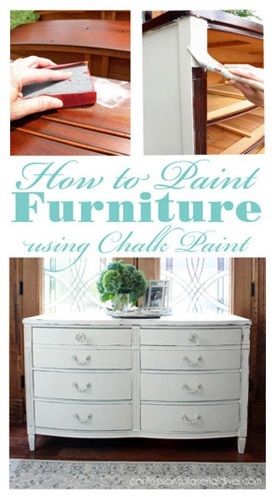 Now I have to check out the glass tutorial because I’ve been wanting to do this to two of my cabinets for years. I like the look. The lights are much better than the pendants. I LOVE the pendants! Great price, too. Oh my goodness, Christy, those lights are SO BEAUTIFUL! Just perfect for the space and the lights along with the glass doors add the right amount of sparkle. 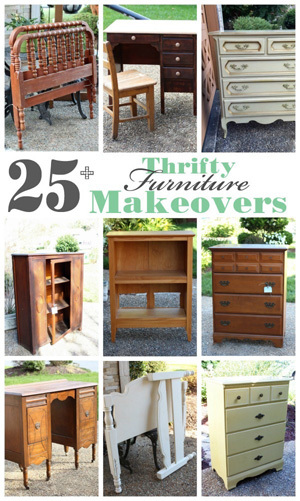 Loving your makeover and can’t wait to see the tile! Love these new kitchen lights! Good job. Like glass fronts on a cabinet or two also! Those lights are amazing. 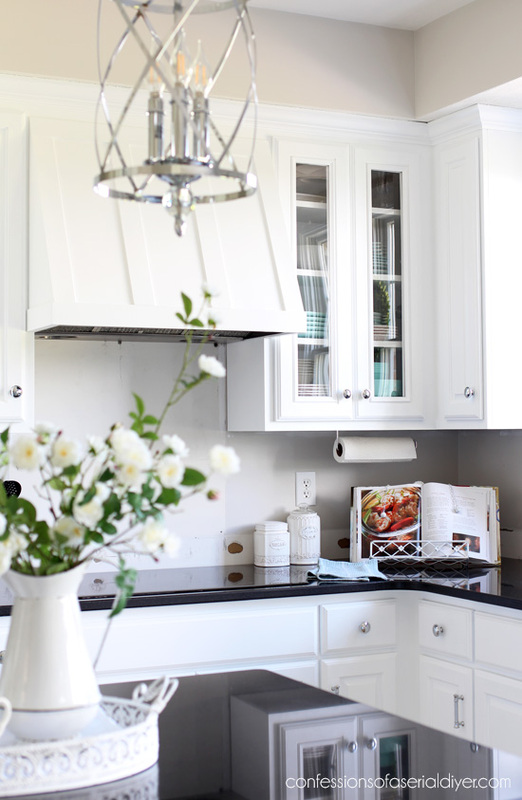 Your kitchen is looking so much more like you! 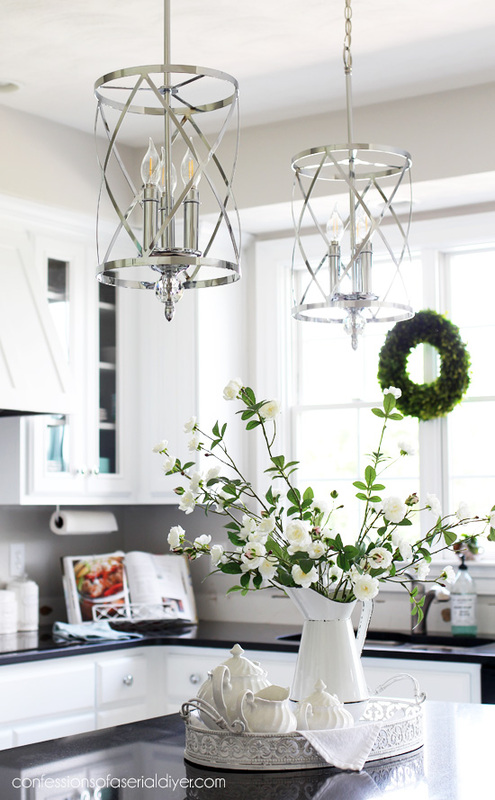 It’s funny Christy because before you started and were shopping around other opinions concerning your redo, I thought of those EXACT pendant lights but of course style is all subjective. So glad to see them and they are beautiful with your updated look! Must be so nice to walk into that lovely kitchen first thing in the morning. Wow, Christy… those pendants are quite beautiful and quite perfect! The glass doors definitely lend more interest to that corner, and I’m looking forward to seeing the floating shelves! Great work, friend! I love those lights. You’ve done a great job on your kitchen. I am so in love with your new lights. You are right, they are the perfect amount of bling. So scrumptious! In fact, I love everything you have done. You are my hero girlfriend. It looks fantastic! You are amazing. It is looking beautiful. Love the pendants you chose. Oh my gosh! I LOVE them! What a difference! Can’t wait to see the rest! As always you have designed a beautiful, amazing room (is it really the same space). Your hard work has paid off and every time you enter your kitchen to prepare meals for your family you are going to feel the pride. Still my heart…those pendants are so gorgeous! I love your pendant lamps! To be truthful there are very few that I usually like. I don’t know, it just seems that everything I see is just not perfect. These are very pretty and not too big. Good job! 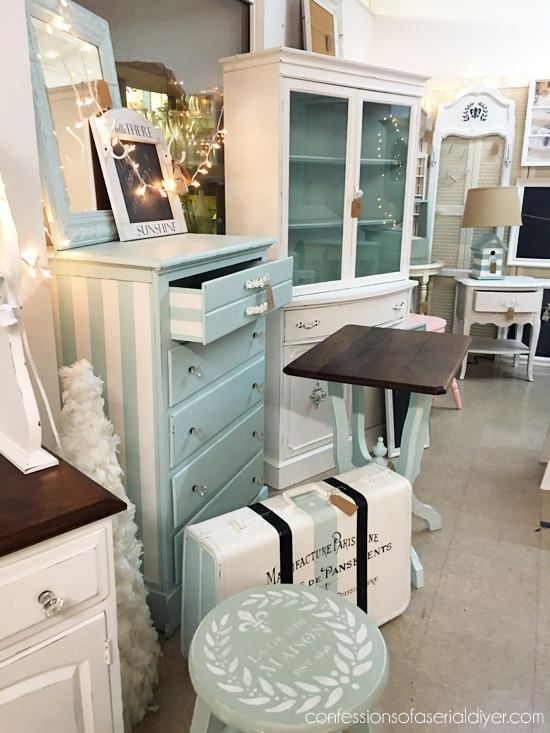 I must say I’m loving everything, the glass doors I love that just a little touch of your blue dinnerware make it pop and the pendant lights I really love, everything is coming along just lovely.